Inspired by the Hindi phrase referenced in his company’s name, Dev Joshi along with his family members, Ritu Joshi, Preeti Joshi, Sunita Joshi and Narender Joshi, founded JMD Furniture with the goal of building a business capable of living up to the values expressed every time the words “Jai Mata Di” are spoken. When converted to English, the phrase literally translates as, “Hail the greatest mother of all,” but its meaning encompasses so much more than that and is typically associated with a sense of positivity, good vibes, and gratitude for all that mother nature provides. Drawing on the principles inherent in “Jai Mata Di,” Dev and the Joshi Family created a company known for its deep commitment to customer service as well as its elegant selection of furniture. JMD Furniture started out as a small business with just a handful of employees, but Dev Joshi and the Joshi Family set out to create and implement a long-term plan that would allow the company to enjoy a lengthy period of sustainable expansion. Dev’s foresight is one of the principal reasons JMD Furniture is now one of the most prominent furniture companies in the entire Northeast. 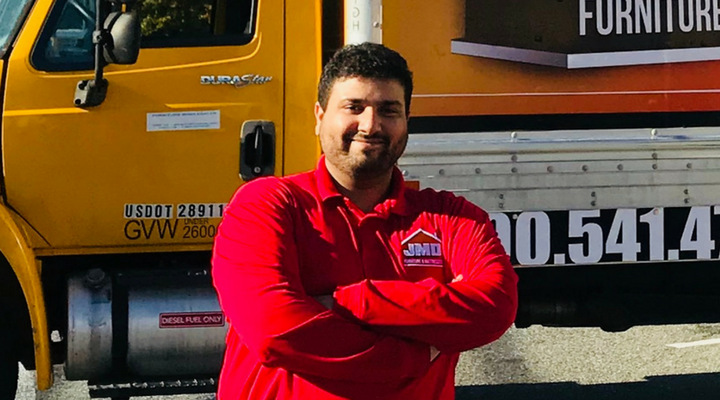 Before becoming the founder and CEO of a successful furniture company, Dev worked diligently to develop a versatile skill set by working day and night after completing high school. The skills he honed while working during these days and nights have been of immense value to Dev throughout the entirety of his entrepreneurial career, and it should come as no surprise that the company he owns has been recognized by the Prime Buyers’ Report as a top ten trusted and valued furniture dealer. “Jai Mata Di”, which is the concept that initially inspired me to pursue a career as an entrepreneur, just seemed to be perfectly suited for the furniture industry. We started out small, but we’ve been able to expand quite a bit over the years. What inspired you to start this business? How do you make money? I was highly inspired by the hard work my family had put in from the first day we landed in this country. My father had been in furniture prior to us starting our own company, but when the previous company struggled to keep up their business in the economy, we saw our opportunity to advance and try to reach our potential. While businesses struggled, we put our hard work together into our company, and that’s what led to us to start a company with our core values. This is when we saw a unique opportunity to apply the idea of “Jai Mata Di” to an entrepreneurial endeavor, but it wasn’t until later that I decided the furniture industry represented the best opportunity for the kind of company I wanted to build. I’m not sure of the exact time frame, but I know it took longer than I expected and much longer than I was comfortable with. We had to make some changes early on, and those were stressful times to be sure. Yes, it was very scary. We had taken a loan out on our house and borrowed money in a time when the economy was about to crash. Luckily our bank wasn’t the bank that crashed, but it was scary. Knowing that if we failed, we would lose the place we take shelter in, and everything would come crumbling down kept us from sleeping during the first few years of my entrepreneurship career. It was very scary, but believing in Jai Mata Di is what kept us going. The only real thing we had to give back to our first store was our hard work, and we gave that intensely. Then we grew to quite a few stores. We also made a few key changes that have enabled us to thrive in the years since. We had purchased the company that my father worked at, and although the store was on the brinks of shutting down, it needed proper attention. There were some customers, but one key thing that was missing previously was customer service and our ability to make our customers feel like they are purchasing from a family store. We created that as our first marketing strategy. Thankfully it worked, and we started seeing repeat customers. I work directly with our marketing team, and with our marketing engineer, my sister, Preeti Joshi; and one thing that really works well is dominating social media to gain attention. While many furniture companies feel as if social media advertising is for children and is useless, we are dominating it to gain leads and to convert them into a revenue stream. Our goal has always been to provide customers with both the lowest price possible and the most outstanding level of service, and every day that goal leaves me with a host of tough decisions regarding how to strike the ideal balance between the two without sacrificing one for the other. What do you think it is that makes you successful? What has been your most satisfying moment in business? It has to be my willingness to listen. I believe that by actively listening to our customers we can develop a deeper understanding of our various strengths and weaknesses, which in turn allows us to constantly improve everything we do as a company. We currently have seven stores in the DC Metro Area, and we have plans in place to expand while still maintaining our longstanding commitment to exceptional customer service. When I wake up each day, I look at my beautiful daughter’s eyes, and I’m most excited about getting to work and interacting with our great employees and our wonderful customers. I strongly believe that I deserve to do well for myself so I can take care of everyone around me. Everyone includes my family, my friends, and my extended family, including my charity. My daughter is about to be two months old, and I owe it to myself to be a great father, and I owe it to wife to be a great husband. I owe it to my parents to be a great son, and I owe it to my work to be a great boss. Lastly and most importantly, I owe it to myself to reach my potential on a daily basis and close the gap. Grand Cardone’s “10X Rule”, and “Sell or be Sold” have been the best inspiration for me, but there have been so many others that have helped me grow throughout my career as an entrepreneur. We created a catalog for customers who may not have found what they were looking for when they visited the store in person. It’s made a big difference for us. We also purchased a Sales training platform from Grant Cardone for all of my employees, so all of my current customers and future customers are to receive the best service.